Organise to recue the NHS! 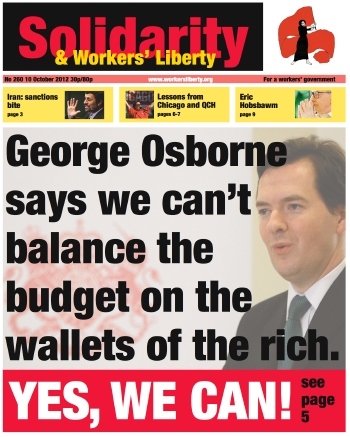 "Can't balance budget on the wallets of the rich"? Yes, we can! At the start of October, on the initiative of the NHS Liaison Network, Labour Party conference voted to prioritise the NHS for debate and then passed a resolution calling for the repeal of the Health and Social Care Act, opposing the cuts, and demanding the rebuilding of the NHS, paid for by taxing the rich. Within hours of conference passing the resolution, Labour leader Ed Miliband told Channel 4 news he could not promise not make cuts in the NHS. The TUC’s “A future that works” demonstration on Saturday 20 October (assembling at Embankment at 11 a.m.) will be an important opportunity to send a message of defiance to the government. The bigger and more belligerent the demonstration, the more galvanised and emboldened people will feel going into the fights ahead. Anti-austerity protests in Spain are continuing to grow, with many cities witnessing near-daily protests. There were marches in 56 different cities on Sunday 7 October, mobilising tens of thousands of people. Around 60,000 people marched in Madrid. Leah Lakshmi Piepzna-Samarasinha is a Toronto-based writer and activist. Much of both her writing and activist work focuses on the struggles of LGBTQ people, particularly queer and trans people of colour. Street cleaners in the richest borough in London will vote on whether to strike, with action likely to take place on 29 October if the strike vote wins a majority. The workers, who are employed by contractor SITA in the Royal Borough of Kensington and Chelsea, are paid £7.85 an hour — less than the £8.30 that even Boris Johnson admits is the minimum amount necessary to live a decent life in the capital. Their pay is also significantly lower than other workers working for contractors in London Boroughs; street sweepers in the City of London earn £8.30 an hour. The GMB union has been conducting a campaign of demonstrations outside Next stores to highlight the issue of low pay at the high-street clothing retailer. The union is demanding a pay increase for all staff, who are currently paid at the national minimum wage of £6.19 (for workers aged 21 and over). GMB wants workers to be paid at least £7.20 an hour, the “living wage” for workers outside London. Teachers at Bishop Challoner school in East London have voted to strike against increasing inspections and observations after their headteacher threatened to hold a mock OFSTED inspection. NUT and NASUWT members already voted unanimously not to cooperate with any mock inspection, as part of their unions’ industrial action against excessive workload. The Marxist historian Eric Hobsbawm died on 1 October at the age of 95. I will personally remember how, when I was a new undergraduate history student, Hobsbawm kindly replied to my precocious letter about the world financial crisis in 2008. That said, Hobsbawm was a political figure and deserves to be appraised politically. In Solidarity 242 (18 April 2012), we began series of recollections and reflections from activists who had been involved with the “third camp” left in the USA — those “unorthodox” Trotskyists who broke from the SWP USA in 1939/40 to form the Workers Party, and the tradition they built (the Independent Socialist League, and later the Independent Socialists and International Socialists). Here, we reprint an extract from a speech by Phyllis Jacobson given at the “Oral History of the American Left Conference”, organised by the Tamiment Library in New York from May 6-7, 1983.